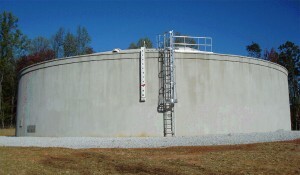 WW Associates assisted the Town of Amherst with the design of a new 1.0 MG ground water storage tank project. The new tank was required to offset the general lack of effective storage volume in the Town’s existing water storage, provide higher water pressures throughout the system during fire events, and provide fire flow to the L. Barnes Brockman, Sr. Business and Industrial Park. A PER was prepared to evaluate current/future water demands, compare water tank construction materials, and select the most cost effective water tank alternative. A field GPS survey was conducted to determine the base and overflow elevations for the Town’s existing water storage tanks; elevations were used to establish a datum for locating the water tank at the site.